This is it. Part 3. The final installment of the Mooselook videos. In this one, you get to see the little house that love built, and that needs a little lovin’ now to bring it fully back to life. Not a lot of lovin’. Just enough to get it past a few winters of excessive snow and absent family. Thanks for taking us into life on vacation this week…..good stuff. I hope you guys had a great time and I look forward to seeing y’all back here soon. Love, love, love the cabin! Love the stories you told, too. I think you did an amazing job walking up the stairs while talking. I’d never have made it! I can almost smell the cedar. Looks like a fun place to take a vacation. When you say rental, do you mean like for a weekly vacation-type rental? Yes, weekly rentals. Probably starting next summer, as we have some things to fix up first. 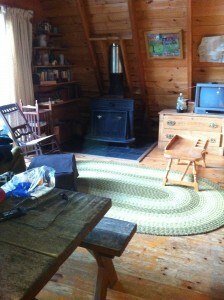 Then, the next year, after we winterize it, we’ll do year-round rentals. There is skiing nearby, and of course the frozen lake is a wonderland! Love all the wood paneling! And you ride a bike….what’s with all the huffing and puffing girl!???? Oh, do you have to pay property owners dues or anything there? None. Low property taxes is all they pay. My excuse was that I’d just rowed for an hour, and trotted straight up those stairs while talking. And I’m sticking to it! Great cabin! Just looks relaxing to hang out and enjoy nature. It’s wonderful. I love waking up to the sound of the birds. It’s an easy place to fall in love with. How awesome is it that his parents bought this place and engaged their children in slave labor 40 years ago, so that we can have it to enjoy it now????? $700 for that lot it is sitting on…that goes for $300,000 now. Hi Pam…I really love the stories you told us…Thanks! !